For other uses, see Trivial Pursuit (disambiguation). Trivial Pursuit is a board game from Canada in which winning is determined by a player's ability to answer general knowledge and popular culture questions. Dozens of question sets have been released for the game. The question cards are organized into themes; for instance, in the standard Genus question set, questions in green deal with science and nature. Some question sets have been designed for younger players, and others for a specific time period or as promotional tie-ins (such as Star Wars, Saturday Night Live, and The Lord of the Rings movies). The game was created on December 15, 1979 in Montreal in Quebec, by Canadian Chris Haney, a photo editor for Montreal's The Gazette, and Scott Abbott, a sports editor for The Canadian Press. After finding pieces of their Scrabble game missing, they decided to create their own game. With the help of John Haney and Ed Werner, they completed development of the game, which was released in 1981. In North America, the game's popularity peaked in 1984, a year in which over 20 million games were sold. The rights to the game were initially licensed to Selchow and Righter in 1982, then to Parker Brothers (now part of Hasbro) in 1988, after initially being turned down by the Virgin Group; in 2008 Hasbro bought the full rights, for US$80 million. As of 2014[update], more than 100 million games had been sold in 26 countries and 17 languages. Northern Plastics of Elroy, Wisconsin produced 30,000,000 games between 1983 and 1985. In December 1993, Trivial Pursuit was named to the "Games Hall of Fame" by Games magazine. An online version of Trivial Pursuit was launched in September 2003. The object of the game is to move around the board by correctly answering trivia questions. Questions are split into six categories, with each one having its own color to readily identify itself; in the classic version of Trivial Pursuit, these are Geography (blue), Entertainment (pink), History (yellow), Arts & Literature (originally brown, later purple), Science & Nature (green), and Sports & Leisure (orange). The game includes a board, playing pieces, question cards, a box, small plastic wedges to fit into the playing pieces, and a dice. Playing pieces used in Trivial Pursuit are round and divided into six sections, similar to a cheese triangle. A small plastic wedge, sometimes called cheese, can be placed into each of these sections to mark each player's progress. During the game, players move their playing pieces around a track which is shaped like a wheel with six spokes. This track is divided into spaces of different colors, and the center of the board is a hexagonal "hub" space. At the end of each spoke is a "category headquarters" space. When a player's counter lands on a square, the player answers a question according to its color, which corresponds to one of the six categories. If the player answers the question correctly, his turn continues; a correct answer on a category headquarters space awards a wedge of that color if the player does not yet have one. Wedges are fitted into a player's piece as they are earned. Some spaces say "roll again," giving an extra roll of the die to the player. The hub is a "wild" space; a player landing here may answer a question in the category of his choice. Questions must be answered without any outside assistance. Any number of playing pieces may occupy the same space at the same time. A variant rule ends a player's turn on collecting a wedge, preventing a single knowledgeable player from running the board. Once a player has collected one wedge of each color and filled up his playing piece, he must return to the hub and answer a question in a category selected by the other players. If this question is answered correctly, that player wins the game. Otherwise, the player must leave the center of the board and try again on the next turn. Board and pieces of Trivial Pursuit. 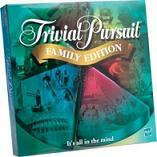 Over the years, numerous editions of Trivial Pursuit have been produced, usually specializing in various fields. The original version is known as the Genus edition (or Genus I). Several different general knowledge editions (such as Genus II) have followed. Other editions include Junior Edition (1985), All-Star Sports, Baby Boomers, 1980s, All About the 80s, and 1990s. In the United Kingdom, Trivial Pursuit players complained that the 2006 version of the game was dumbed down in comparison to previous editions, with easier questions and more focus on celebrities and show business. In October 1984, Fred L. Worth, author of The Trivia Encyclopedia, Super Trivia, and Super Trivia II, filed a $300 million lawsuit against the distributors of Trivial Pursuit. He claimed that more than a quarter of the questions in the game's Genus Edition had been taken from his books, even to the point of reproducing typographical errors and deliberately placed misinformation. One of the questions in Trivial Pursuit was "What was Columbo's first name?" with the answer "Philip". That information had been fabricated to catch anyone who might try to violate his copyright. The inventors of Trivial Pursuit acknowledged that Worth's books were among their sources, but argued that this was not improper and that facts are not protected by copyright. The district court judge agreed, ruling in favor of the Trivial Pursuit inventors. The decision was appealed, and in September 1987 the United States Court of Appeals for the Ninth Circuit upheld the ruling. Worth asked the Supreme Court of the United States to review the case, but the Court declined, denying certiorari in March 1988. In 1994, David Wall of Cape Breton, Nova Scotia, launched a lawsuit against the game's creators. He claimed that in the fall of 1979, he and a friend were hitchhiking near Sydney, Nova Scotia, when they were picked up by Chris Haney. Wall claimed that he told Haney about his idea for the game in detail, including the shape of the markers. Wall's mother testified she found drawings of his that looked like plans for a Trivial Pursuit-like game, but the drawings had since been destroyed. Wall's friend, who was allegedly hitchhiking with him that day, never testified. Haney said he never met Wall. Over the years, there was much legal wrangling, notably around whether the suit should be decided by a judge or jury. On June 25, 2007, the Nova Scotia Supreme Court ruled against Wall. A version of Trivial Pursuit, hosted by Wink Martindale, aired on The Family Channel in the United States from 1993 to 1995 (Jay Wolpert had attempted a pilot in 1987, but it was not picked up). A syndicated version entitled Trivial Pursuit: America Plays aired from 2008 to 2009 and hosted by Christopher Knight. In September 2004, Roger Lodge hosted a sports trivia game show on ESPN entitled ESPN Trivial Pursuit, which aired five episodes. BBC Television produced a Trivial Pursuit game show based on the game in the UK hosted by Rory McGrath. Another British version (with rules/format similar to the Wink Martindale version, and also using the same theme tune as the Wink Martindale version) was hosted on The Family Channel (now Challenge) by Tony Slattery. Birgit Lechtermann hosted a version for VOX in Germany from 1993 to 1994. In 1988, a made-for-television movie entitled Breaking all the Rules: The Creation of Trivial Pursuit aired. Treated largely as a comedy, the movie featured the music of Jimmy Buffett and portrayed the creators of the game as three beer-loving Canadians. In Spain, a version of the show called Trivial Pursuit: Spain Plays premiered in September 2008 on Antena 3. In 1984, Bally Sente released a Trivial Pursuit arcade game. Like the board game, several variants were also released. British software company Domark released a home computer version (billed as Trivial Pursuit: The Computer Game) for multiple formats during the 1980s. This version included pictorial and musical questions but was otherwise mostly faithful to the mechanics of the original board game. Later, Domark released another version called Trivial Pursuit: A New Beginning, also across multiple formats. This version featured a plot about the dying Earth and significantly altered gameplay mechanics. Classic Pursuit: Played just like the board game. A "QUICKPLAY" option was also available, where, to speed the game up, every question would be a wedge question. Up to six can play. The winner is the first one to earn all six wedges, land back in the center hub by exact count, and then give a correct answer. Party Pursuit: Up to three can play. The computer randomly spins categories until there are three to choose from. A correct answer by the first player to buzz in earns the wedge; a wrong answer gives the opposition a chance, as well as take away any wedges earned in a category. The first player to earn all six wedges wins the game. After 20 questions, the computer begins selecting categories for the players. Point Pursuit: Same as Party Pursuit, except point scores are kept, and questions range from 250 to 1,000 points. Players can also wager any or all of their scores on one final question. Bonus points are earned for a wedge and for how much or how little time it took to answer a question. Spelling accuracy: strict, where spelling must be precise. This game featured a total of seven voice-overs, one host, and one for each of the six categories: People & Places (blue wedge), Arts & Entertainment (pink wedge), History (yellow wedge), Science & Nature (brown wedge), Sports & Leisure (green wedge), and Wild Card (orange wedge). In 2003, Bolenka Games released an online game of Trivial Pursuit on the now-defunct website Uproar.comwhere it features five editions such as: Genius, Silver Screen, Music, 1980s and TV. Trivial Pursuit was released for a number of home video systems, including Sega CD, Wii, Xbox 360, Xbox One, PlayStation 2, PlayStation 3, and PlayStation 4. The board game was also adapted into a mobile game called Trivia Crack. ^ a b "Trivial Pursuit History". ideafinder.com. Retrieved 2017-07-28. ^ Mary Bellis. "The History of ''Trivial Pursuit''". Inventors.about.com. Retrieved 2012-07-07. ^ "Fascinating facts about the invention of TRIVIAL PURSUIT". The Great Idea Finder. May 2005. Retrieved 12 November 2016. ^ "Trivial Pursuit sells for a non-trivial sum: $80 million US". CBC News. Cbc.ca. 31 March 2008. Retrieved 2012-07-07. ^ Ward, Eric (29 September 2003). "Trivial Pursuit Launches Online Version". Urlwire.com. Retrieved 2012-07-07. ^ Stelfox, Hilarie (19 December 2016). "Tried and tested family games for Christmas". Huddersfield Examiner. ^ Jones, Beth; Henry, Julie (17 December 2006). "Trivial 'brain-teasers' enrage game's fans". The Telegraph. Telegraph.co.uk. Retrieved 2014-07-16. ^ Overend, William (25 October 1984). "Trivial Suit". Prescott, Arizona: The Courier. Retrieved 2014-07-16. ^ Worth v. Selchow & Righter Company , 827 F.2d 596 (9th Cir. 1987). ^ "Hitchhiker loses Trivial Pursuit rights battle". Australian Broadcasting Corporation News. Abc.net.au. 26 June 2007. Retrieved 2014-07-16. ^ Grant, Jules (6 April 2008). "Trivial deals, new gameshow for Debmar-Mercury". C21 Media. Retrieved 2014-07-16. ^ "Trivial Pursuit". International Arcade Museum. Retrieved 2014-07-16. ^ Davison, John S. (March–April 1987). "Issue 26 - Trivial Pursuit". Page 6. Retrieved 2014-07-16. ^ "Trivial Pursuit Edition Genus". cpc-power.com. Retrieved 2014-07-16. ^ "ZXSoftware.co.uk". ZXSoftware.co.uk. Archived from the original on 2013-03-09. Retrieved 2012-07-07. ^ "Trivial Pursuit: Commodore-Genus Edition". Lemon64.com. Retrieved 2014-07-16. ^ Hughes, Gwen (November 1986). "Trivial Pursuit". Ysrnry.co.uk. Archived from the original on 2014-06-18. Retrieved 2014-07-16. ^ "Trivial Pursuit: A New Beginning". Lemon64.com. 1988. Retrieved 2014-07-16. ^ a b South, Phil (January 1989). "Trivial Pursuits - A New Beginning". Ysrnry.co.uk. Archived from the original on 2014-06-19. Retrieved 2014-07-16. ^ "Trivial Pursuit: A Strange New Beginning". Incredibly Strange Games. 21 September 2010. Retrieved 2014-07-16. ^ "Trivial Pursuit Online Games Brings World's Most Popular Trivia Game to Uproar.com". November 18, 2003. ^ "ProReview: Trivial Pursuit". GamePro. IDG (70): 56. May 1995. Wikimedia Commons has media related to Trivial Pursuit.